We should be clear: the preservation of historical heritage has long since ceased to be considered a desirable end in itself. Today it constitutes a means for growing audiences and maximising revenues – as most notoriously is the case with the National Trust. Worse, as Florence Hallett reports below, it now also provides cover for concocting phoney histories to generate (chump) tourism. The National Trust’s own heritage portfolio is proving a nice little earner. The trust employs over 7,000 permanent staff and a further 4,000 seasonal staff (in addition to more than 60,000 voluntary staff) at a total cost this year of £194 million. 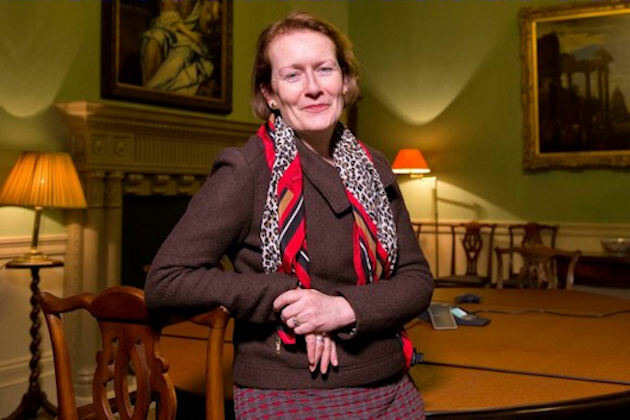 Its Director-General, Dame Helen Ghosh, would seem to earn between £220,000 and £229,000, with a further 97 staff members earning between £199,000 and £60,000. In surveys, the staff members express exceptionally high levels of satisfaction (97%). Growing visitor numbers and income is clearly a high priority for these administrators. Above, Dame Helen Ghosh, who worked as a civil servant for 33 years – as photographed by Jeremy Young for the 24 February 2013 Sunday Times article “A wind turbine is a thing of beauty”. Although National Trust visitor numbers are presently at a record high (21.3 million last year over 19.2 millions in 2013) the trust has expressed alarm because in surveys “visitor enjoyment scores” dropped by 2% last year to 60% – which figure is below the Trust’s own target of 68%. On 12 September the Daily Telegraph reported that the trust’s 4.2 million members – another record high – are said to be “getting tired of the most popular attractions and it [the trust] has to do more to make them interesting” (“The National Trust’s treasures are losing their lustre”). However, it may be the case that the members are aghast and dismayed by the National Trust’s self-declared “Disneyfication” policies under which properties can be held to contain “too much historic stuff” and to provide too few opportunities for “interactive” participation by all age groups. Plans to attach bogus gates to one of Chester’s most well-known historic monuments were realised temporarily last week, during an extraordinary spectacle commemorating the Queen’s 62-year reign. 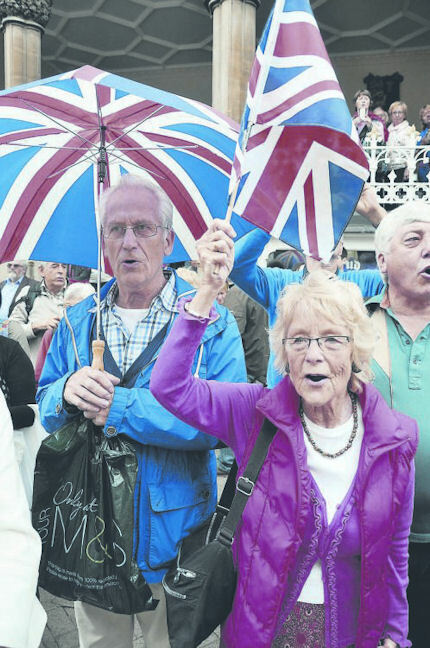 In an event that saw giant effigies of Queen Victoria and Queen Elizabeth II paraded through the historic Eastgate last Wednesday, commentary, and an especially composed poem were provided by husband-and-wife town criers, David and Julie Mitchell. A spokesperson from Cheshire West & Chester Council had said that the ceremony would involve recreating “gates at Eastgate with interlocking shields. 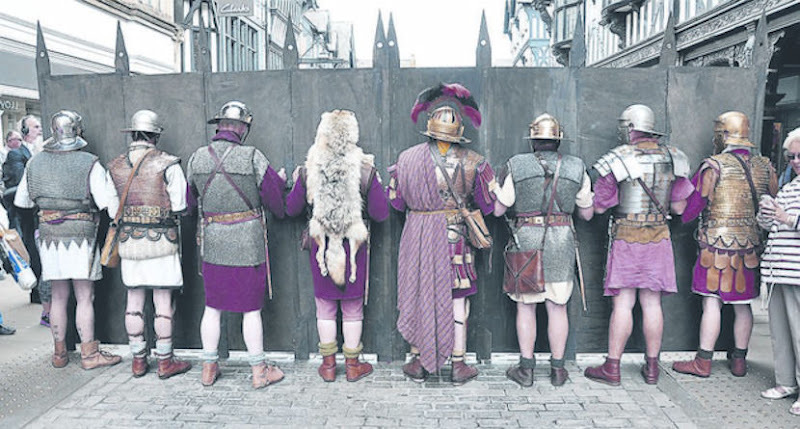 As part of the pageantry, they will knock on the shields and be let in.” In the event, The Chester Standard reported that local businessman Gordon Vickers, the brains behind the campaign to attach gates to the historic structure permanently, arranged for Roman soldiers to hold up wooden gates, which the queens passed through. Above and below, three photographs of the so-called Chester Parade from a group shown on photosnack. So far, planning permission has not been sought for the controversial plan to attach iron gates permanently to the Eastgate, which Vickers claims could attract millions of visitors to the city. 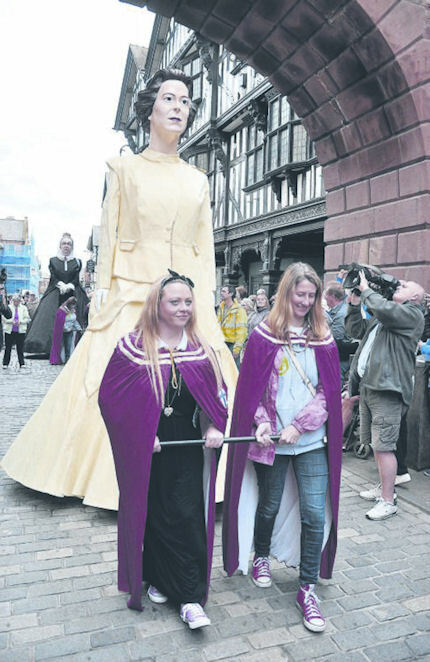 In January he told The Chester Standard, “This could rival the changing of the guards at Buckingham Palace in London if it’s done in the right manner.” The Chester Archaeological Society has described the plans as “anachronistic” and a “historical pastiche”. Nevertheless, Historic England has expressed support for the plan, and this latest revival of the scheme suggests that planning permission may be sought some time soon. This entry was posted on September 16, 2015. It was filed under news and was tagged with Dame Helen Ghosh, Florence Hallett, The Chester Archaeological Societ, the Chester Parade, The National Trust.